TEAMWORK IS OFTEN CITED AS THE KEY FACTOR IN ANY MAJOR SUCCESS STORY, whether it is a Super Bowl champion, a leading health care organization or even a thriving marriage. Baratz & Associates and CORA Capital Advisors—two South Jersey firms with decades of experience in the financial services realm—have both accomplished a great deal on their own. But when the opportunity arose to join forces, it made perfect sense to become a team and find out what they could achieve together. With both companies now under one roof, clients can save valuable time by addressing all of their financial needs at the same location. Sean Balliet, a CPA/CFP at Baratz, notes a recent meeting he and Cocivera had in which a mutual client was able to discuss his 2018 tax return, ideas for 2019 and investment goals. 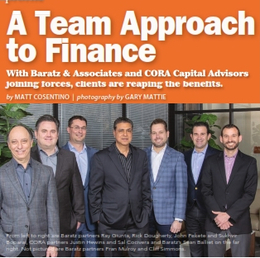 In creating a forward-thinking model for financial services, Baratz and CORA are able to assist a wide variety of clients at different stages of their lives. But their expertise is particularly valuable for owners of closely held businesses, self-employed professionals like attorneys or physicians or high net worth executives from Fortune 500 companies. provide that for them.” No matter who they are working with, the leaders of Baratz and CORA share another important trait that made their alignment logical—a passion for the work. Time is a resource for successful business owners and executives, and allowing their accountants and advisors to work collaboratively can save both time and money. With experienced professionals in all aspects of financial services, every situation that arises can be handled internally. While small business owners are often overlooked in today’s economy, they receive the attention they deserve here. With professionals looking out for their financial future, they are able to focus on the day-to-day operations of their business. “We focus on the big picture—from looking to grow their top-line revenue to helping with their financial planning,” Balliet says. Baratz & Associates has been serving local clients since 1982, and while the company has grown since then—includ- ing its alignment with CORA—it continues to maintain the personal service and attention to detail it was founded on every day.